Blarney Castle (Irish: Caisleán na Blarnan) is a medieval stronghold in Blarney, near Cork, Ireland, and the River Martin. Though earlier fortifications were built on the same spot, the current keep was built by the MacCarthy of Muskerry dynasty, a cadet branch of the Kings of Desmond, and dates from 1446. 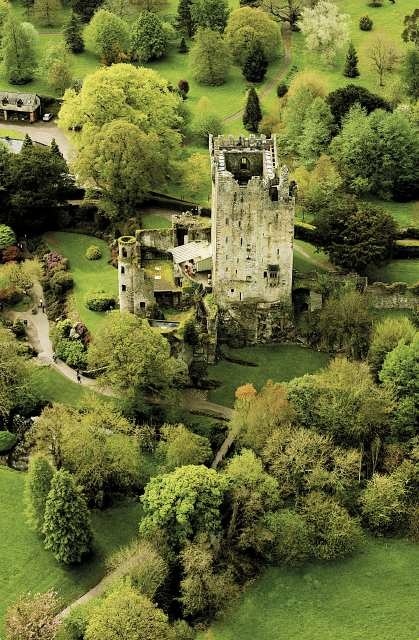 The noted Blarney Stone is found among the machicolations of the castle. The castle originally dates from before 1200, when a wooden structure was believed to have been built on the site, although no evidence remains of this. Around 1210 this was replaced by a stone fortification. It was destroyed in 1446, but subsequently rebuilt by Cormac Laidir MacCarthy, Lord of Muscry. The castle was besieged during the Irish Confederate Wars and was seized in 1646 by Parliamentarian forces under Lord Broghill. However after the Restoration the castle was restored to Donough MacCarty, who was made 1st Earl of Clancarty. Тема „Ефирно“. Изображенията в темата са от A330Pilot. Предоставено от Blogger.